Buy and sell online, on your mobile or tablet with eBay. Shop for clothes and fashion, watches and jewellery, as well as cars, and earn top cashback. Buy tickets to gigs, sporting events, shows and attractions at Ticketmaster UK. Shop for theatre, music and sports tickets and earn cashback rewards. Shop for theatre tickets at ATG Tickets. 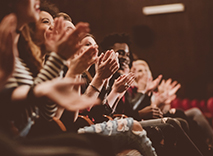 Buy tickets for London shows and musicals like Jersey Boys and Wicked, events and comedy and earn cashback. Buy sport, music and concert tickets at See Tickets. Get tickets for Glastonbury and gigs, theatre and West End show tickets and earn cashback. 365 Tickets sell tickets for the London Eye, London Zoo and the Tower of London. Buy Drayton Manor and Disneyland Paris tickets and earn cashback. Visit Theatre Tickets Direct for show tickets. Get tickets for Les Miserables and Wicked, and attractions like the London Eye, and earn cashback. Explore London attractions like Buckingham Palace, The Shard, the Tower of London and Madame Tussauds on The Original Tour's routes and earn cashback. Get a great deal on things to do with the family at LittleBird. Browse offers on theatre tickets and days out, as well as toys, and earn top cashback. Save money on London attractions and hotels with Discount London. Visit London Zoo, the London Eye and the Tower of London and earn cashback rewards. Visit rainforest and Mediterranean biomes at the Eden Project in Cornwall. See plants and gardens or try the restaurant. Buy tickets and get cashback. Front Gate Tickets is our high volume ticketing platform for UK festivals and unique shows. We power the best in the scene with the largest inventory.